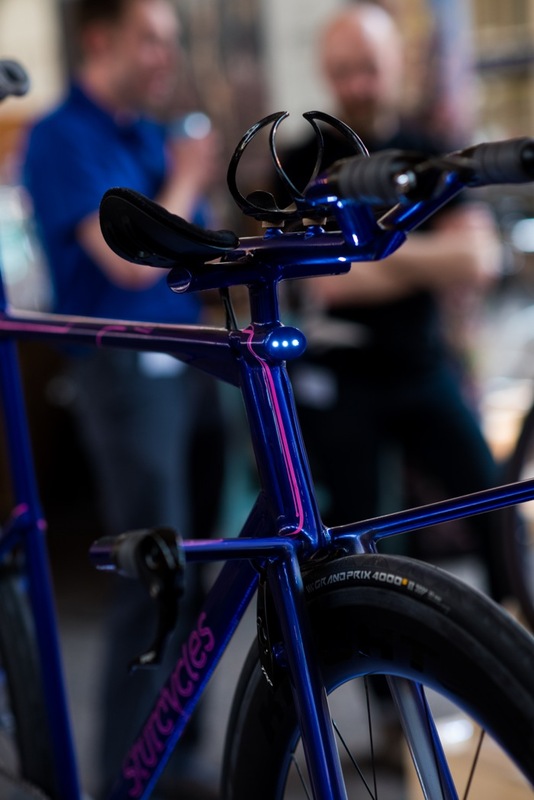 Everyone knows that you shouldn’t judge a book by its cover but the very limited time I had to see the custom built offerings at the Bespoked UK Hand-Built Bicycle show this year meant that such superficiality was sadly inevitable. Despite spending three and a half days in Bristol last month I only had just enough time for the briefest of looks at all the works on show and to catch a few words with a couple of builders. Bespoked had already outgrown its historic home of Brunel’s Old Station last year and so enjoyed a soujourn at the recently re-opened Olympic Velodrome in London instead. 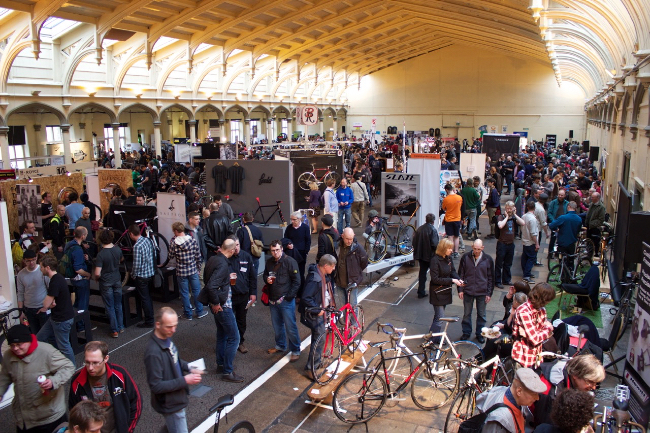 But the ‘lure of the local’ proved too strong for Bespoked organiser, Phil Taylor, and the event returned to it’s native city for 2015, Crucially, the addition of an extra location in the Arnolfini Gallery for the Arts & Design-based part of the show was debuted. This left the whole of Brunel’s wonderful building for the bikes. Which was great, except for the slight hitch that this year I was exhibiting in the other part of the show with MassifCentral, meaning that I was a half a mile from the custom-builds for most of the weekend. After spending the whole of Friday and Saturday talking with the consistently large crowds in the Arnolfini, I abandoned my post for a couple of the quieter hours early on Sunday morning. Having hot-footed it away from the lovely quayside location that we had been enjoying I was finally able to metaphorically kneel in this most hallowed church of custom frame-building. It was never going to be enough time to get under the skin of the show properly and see every finely brazed or lugged detail so I felt that my review of the show should probably be best centred on the surface colours, patterns and textures of the bikes. As I was also exhibiting our own form of cycling graphics across the way, it felt fitting in that respect too. The volume (in both terms of quantity and visual loudness) of bikes sporting unusual and eye-catching paint-jobs had increased noticeably from last year. 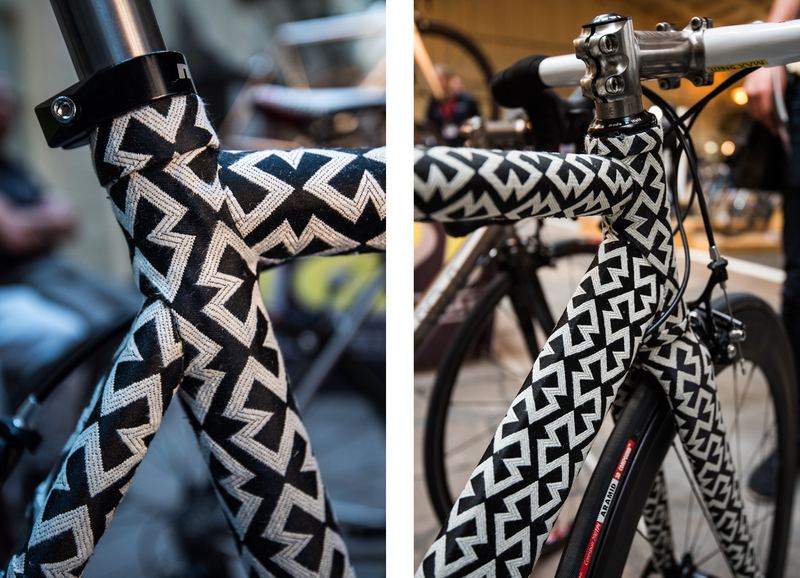 In London last year I noted the Pegoretti and Festka designs in my review of the show but this year they had far more fierce competition to stand out amongst the sea of master-crafted frames on show. Field, Seren, Talbot, Jaegher, Shed6, Nevi, Dear Susan, Donhou and Saffron Frameworks all had frames that matched, if not surpassed, what Festka had brought a year earlier. And of course Pegoretti and Festka were back; and both were re-raising the bar of beautiful paint design and execution to even greater heights. In terms of pure colour Dear Susan and Talbot stood out. Dear Susan’s “Polaroid” bike, with paint by Fat Creations, is a brilliant one-liner that had been masterfully executed. The exceptionally bright stripes were perhaps dulled a little over the weekend in some eyes by the doses of Papadiablo Mezcal that were being liberally handed out (and self-administered) by Dear Susan’s Petor Georgallou. Even this most potent of firewater didn’t dull his edge in the late night Saturday Rollapaluza session at the nearby Mud Dock cycle cafe. Whether it’s Rollapaluza or frame-building, Dear Susan thrives on doing things differently. Keep an eye on them. Over on the Talbot stand I was surprised to see a bike and a face I knew. 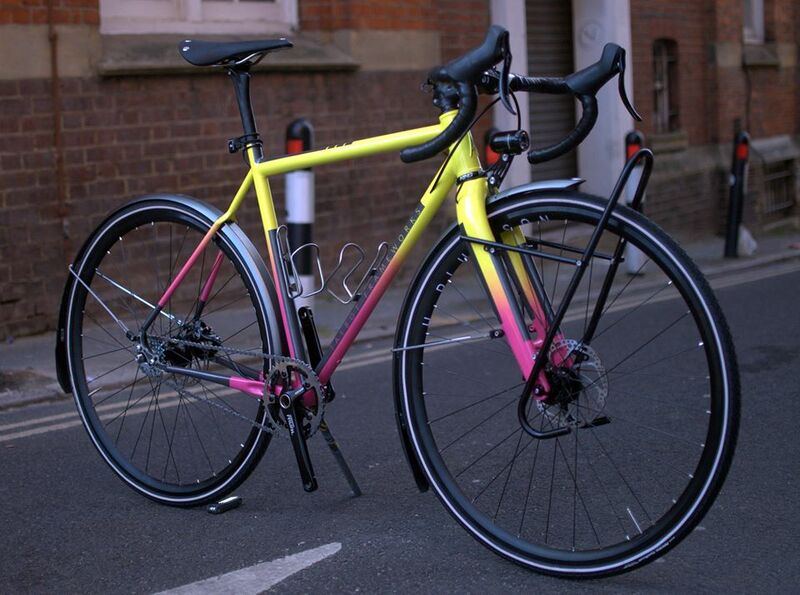 The vibrant yellow and pink bike belonged to a friend on the LFGSS forum and the face belonged to the owner of the Time Machine bike that was featured in my Bespoked write-up last year, Neil Hammet, who is now helping Talbot owner Matt McDonough. Their painter of choice, Doktor Bob, is local to Bristol and a master of bright colour fades. As well as custom-builds and the steel-lugged, carbon-tubed Dalsnibba’s that they are becoming known for, Talbot are also pushing the boundaries of Di2 technology by using pure silver applied to the surface of the frame to create circuits, a system they have dubbed “Tesla”. It’s a beautiful example of the old adage that “Less is More”. Field’s take on paint was also a case of “less is more”, provided that you allow the ‘less’ part to hot pink stripes on the otherwise relatively muted grey and black of the angular design. However, it was the tiny black crosses – rather like the hairline crosses that characterise the Moon landing photos – that had been added to the grey top tube that caught my eye. Again, execution was the key here; really delicate work that could ruin the rest of the bike if it was even just fractionally sub par, which was not a problem for the excellent Field. Patterns were also the thing at Jaegher and Shed6. Belgian frame builder Jaegher had an airlight steel “Flanders” bike on show that took the iconic yellow and black of the regional flag and played it across the frame in a number of different ways. I wasn’t so keen on the all yellow fork but the triangles on the seat tube were really nice. I would have loved to find someone on the Shed6 stand to tell me about their intriguing blackand white patterns, which looked as though they could be derived from quotation marks or over-lapping letters but time was moving on and I reluctantly moved on too. I’ll have to catch up with owner Felix another time. If we are talking pure surface then the BMX on the Seren stand and the road bike being shown by Nevi took each take some beating. Seren’s tattoo-inspired skulls, swallows and scrolls were hardly apparent until you got within a few inches of the bike. It was so detailed that it really wasn’t obvious if it was hand-drawn, 3D printed or applied as decals under the clearcoat. I’m still none the wiser but I know that I love it. Nevi’s road bike was similaly deceptive from a distance. Initial impressions suggested another, slightky more formal “dazzle camouflage” paint-job but a closer look and, more crucially, a feel told a different story. The repetitive black and white pattern was actually a woven material that had been wrapped over the top of the frame. Upholstered frames won’t be to everyone’s taste for certain but in a show where standing out seemed to be a top priority for more than a few it was at least witty. I couldn’t say the same for the ‘luxury’ Sarto a couple of stands along, which was dripping with 18 carat gold instead. The show was therefore a veritable feast for the eyes. Along with the incredible ultra-orange bike that won ‘Best In Show’ for Enigma at The Bicycle Show in London earlier in the year, we do seem to be seeing a resurgence of the kind of eye-candy bikes that have been away from the limelight for quite some time.. Perhaps we are seeing a shift in the custom framebuilding world. We have passed the initial phase where the few surviving builders welcomed the new young turks who certainly helped save a dying art. But with the popularity of custom frames growing, are builders now needing to work harder to make their designs stand out? 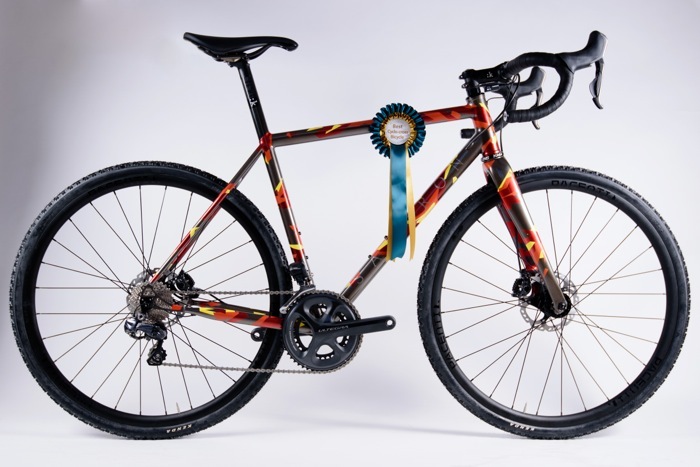 This entry was posted in Bikes and tagged arnolfini, bespoke, bespoked, bicycles, bikes, bristol, custoom, design, frame-building. Bookmark the permalink.